i have one of you puppies Sewfe Grace 11/30/09 birthdate. we love her and so does everyone who meets her. so i have a list of people who want a dog JUST like our sewfe grace. black and very small (she is now 2 and weighs 5.4 pounds) she was the runt of her litter. she is very smart and in the proses of being trained for a theropy dog. once she gets her vest we would also like to get her a sister, also very small, and black. Mr. Wilson was born on 11/26/2006 to Pansy and Frosty and he is the smartest, cutest little boy ever! 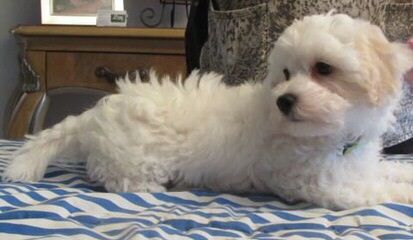 We love him to pieces and if any of our friends are looking for a Maltipoo, we will direct them to you. However, it appears that we can no longer view your furry babies online at dog breeder.com. I tried finding a website using Google, hoping you created your own site, but I do not see one. Please advise if you have a new site so we can view your furry pals often. Mr. Wilson says he loves his new home here in Northern Virginia and he is happy we adopted him. Hello…wondering if you had female white and caramel colored puppy, if so, what is asking price and do you all have a web site?